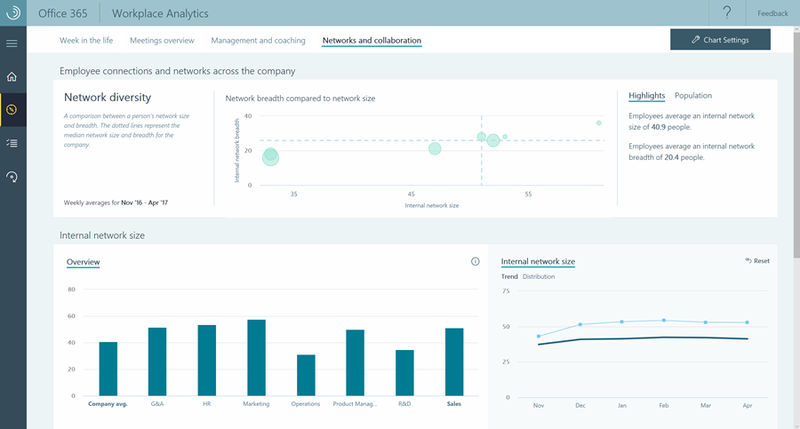 Microsoft Workplace Analytics—a powerful new organizational analytics solution—is now generally available. Workplace Analytics uses a variety of techniques to learn about a workgroup’s productivity through *anonymous* examination of emails, calendars, & potentially information pulled from HR databases. According to a recent Forrester report, increasing employee productivity is the number one priority for C-level executives in the next year, with 96 percent of respondents citing it as a critical or high imperative. Workplace Analytics provides unprecedented behavioral insights that can be used to improve productivity, workforce effectiveness and employee engagement. Workplace Analytics taps into Office 365 email and calendar metadata, including to/from data, subject lines and timestamps, to shine a light on how the organization collaborates and spends time. It turns this digital exhaust—the data that comes naturally from our everyday work—into a set of behavioral metrics that can be used to understand what’s going on in an organization. Microsoft has enabled Workplace Analytics with built-in privacy and compliance capabilities. Customers own their Office 365 data and decide how to apply insights generated by Workplace Analytics to solve tough business challenges. Workplace Analytics only leverages metadata that is aggregated and de-identified.